The first thing that struck him as he opened the door was the uncharacteristic pleasantness of the weather. A perfect start to a Saturday after the dampness of the previous day. He woke up a little later than he had planned and had to hurry to make it up, leaving him without a chance to notice the weather until he stepped out of the house. As he locked the door he realized that he had subconsciously broken into a song. He stopped himself , looked around quickly and let out sigh of relief after confirming that no one had heard him. Still cheerful, he pushed his bike out of his driveway. He had a long day ahead and later, he would thank himself for having found the time to gobble a few slices of the bread before leaving. He finally managed to break out of the traffic jam. He had always wondered on the fact that there seemed to be more people returning home on Fridays than any other day of the week. And add to it the festive atmosphere all around - why were so many people so happy on a Friday? It is almost like everyone in the World hates his job. Of course he looked forward to the weekend too. His roommate would not be home but still it will be a well needed break. He would probably watch a movie or two, and get a long pending haircut. He'd had dinner at his office canteen but the Friday atmosphere made him stop at a bakery near his house to treat himself. He was quite sure he would be too lazy to go out for breakfast the next morning, so he bought a loaf of bread and hastened home as it started to drizzle. He hated rains and was glad that it didn't rain today. The roads were still pretty wet, but he would enjoy his ride. As he eased on to a comfortable speed he caught himself singing again. This time he didn't stop himself. He savored riding in this weather. He was proud of the way his pair of legs and hands work in coordination to control and increase the speed as necessary. Sure, there were a million other people on the road who were as skillful as him - just look at the number of people riding bikes. But that doesn't take away anything from the amazing feeling. He loved riding his bike. He loved the internet. Outside, it was raining pretty heavily now. He was crouched over his laptop constantly refreshing various tabs on his browser to get instant updates. He had been sitting in the same position for the past two hours, and he couldn't think of anything that would remove him from his place for another few hours. As he refreshed another social networking site and realized that there were no new updates, he wondered if he could be spending his time more usefully and immediately brushed aside the thought. Shivering in discomfort, he instinctively covered his naked feet with a blanket to reduce the chillness. It was becoming sultry now - the only sort of weather you would expect from this part of the country. The sun was coming out and so were the vehicles. This city never has a holiday, he told himself. People constantly keep travelling from one place to another with no purpose at all. He lifted the helmet visor to let in air. Wearing a helmet always involves a call between keeping out the dust and letting in the air, and the later usually wins. He gladly breathed in the relatively fresher air. He needed fresh air, and he needed it badly. It had been months since he had even talked to his friends, let alone meet them. He had spent the past few weekends slouched in the same fashion and there was no doubt in his mind now that he was getting addicted to the internet. 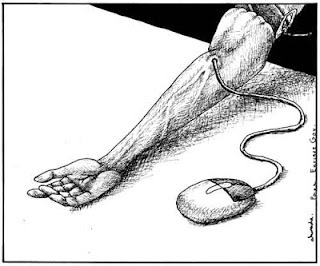 Will it really be so difficult to be disconnected from the web, he asked himself. No, It shouldn't be. He used social networks just out of choice. He was just a passive user who was more interesting in watching the activities of his "friends" than announcing his own activities. In fact no one would miss his presence online if he inactivated his account at the very moment. Outside, the rain had considerably reduced. He could hear water drops trickling down from somewhere. Like drops of coffee trickling out of a filter, motorbikes can find a way out of most traffic jams. However when half the width of the road is stagnated with water from the previous day's rains, even the shrewdest of drivers are forced to wait in a logjam. A traffic jam on a water-logged road is a motorcyclist's nightmare. To add to it, it was sweltering hot now. He glanced at his watch. He was sweating profusely and suffocating within the helmet. He decided to remove his helmet, and loosened its straps when the bus ahead of him started moving slowly. Immediately the car behind him beeped its horn loudly, forcing him to move forward. His phone beeped and he glanced at the display. "Harsha calling". Another close friend he had been meaning to give a call for a long time, but had never summed up the strength to do so. Apprehensive of a a mild rebuke for being out-of-reach for so long, he pressed the Accept button and said "Hi da!!". As his friend greeted him back, he realised that nothing was amiss, and close friends can continue conversations they had years back as if they had been in touch every day. Ending the call after an hour he realized that he had missed a lot in not remaining in touch with his friends. Harsha had called him to arrange a get-together the next day, and convinced him to join. The rain outside had stopped, and his mind was easing out. The traffic eased out as he reached the highway. He increased his speed a little - he could still make it on time. It had really been long since he had met any of his friends, and he was quite excited at the thought. His mind drifted of to the last time they had met, when he noticed a water tanker ahead of him leaving a trail of water in its wake, which would soon evaporate due to the heat. He realized that he could not remember any of the vehicles he had noticed in the past few minutes, and that he had been riding mechanically. He forced himself to concentrate a little more on the present. He was quite sure that his lack of concentration was not a result of his addiction to the internet. He had always had trouble concentrating on the present, and as a result, poor observational skills. He rarely noticed the details in his surroundings. "Come on! ", he told himself, "you can't blame everything on the internet". But then, another part of his mind countered, he couldn't deny that his addiction had affected him. Only the extent to which it had affected him was debatable. There is only one way to know for sure, he decided. He would remain away from the internet for a month, and see how he fares. Before that, he would have to remove all the temptations to go online. He would start by deleting his Facebook account. He clicked on the "Deactivate Account" link in his browser page, to be greeted with a confirmation window. His cursor hovered over the confirm button, and hesitated. There was no time to hesitate, and it was an impulsive decision. Being just a few minutes away from his rendezvous, he was going at a fair speed, and was getting ready to overtake a dump truck passing on the left lane. The dump truck was carrying loose gravel, and just as he lined up with the rear end of the truck, a handful of stones fell out of the truck. The first flew straight to his helmet, through his open visor, and hit him hard on the chin. He exclaimed in pain, and noticed that there were more stones flying towards him. He decided to brake, and as he braked hard, a SUV speeding behind him brushed his bike's rear. Thrown towards the ground, he felt his untidy hair fall over his forehead. His helmet was flying ahead of him, the straps he had loosened a few minutes before flapping on the helmet's mass rhythmically. He hit the ground full stretch, but the helmet was still revolving. He could see the visor now, dirty and scratched, the scratches combining by chance to form the first letter of his name. His bike was lying before him. Its MRF tyres covered in mud. He wondered at his ability to grasp in these details when he least needed them. He felt something wet flow over his spine. Someone was running towards him now, but he couldn't make out their features. His mind was starting to become hazy. It was funny how time seemed to slow down at the most critical moments. He felt like a character out of a computer game. His mind drifted on. Computer game - computer - internet - Social Network. The events of last night played back in his mind. The rain, the dil pasand (or was it dil kush? ), the depression, the call, the plan (would he be able to meet them now? ), and his conviction to erase his online presence. As he recalled hovering over the delete button, he realized that he was in great pain. He couldn't move his legs, and he felt an immense urge to close his eyes. He forced himself to think back on the previous night. Did he click the button? Think, dammit! This is important. This could mean life or death! Note : Though some parts of this story are based on real incidents, I wrote it with a wild idea - what if social networks have more power over us than we fathom?